Moon Rock will run July 16th to August 30th | An opening reception will be held July 16th, 6 - 8 pm. The 1960s have once again captured our imagination— and we have a lot in common with that decade, for we have found ourselves once more in the midst of a “youthquake,” global unrest, music festivals, and a technological boom. But this upcoming exhibition is an ode to one of the most exciting moments of the 60s: the US space program. Recalling the photos of the moon NASA then released, we see in our mind’s eye grainy and streaked images of the cratered lunar surface. Those low quality visuals were, in fact, what NASA released to avoid revealing to the USSR the imaging potential of US spy satellites, as this space race was a defining aspect of the Cold War. The actual images, at full resolution and quality, certainly live up to their role as the crux of the program which eventually culminated in the moon landing. So, while it may be trite to say such a thing in an age of endless digital reproduction, these photographs are something one simply must see in person. To think that these images were taken five decades ago gives an entirely new meaning to the power of the mechanical gaze. 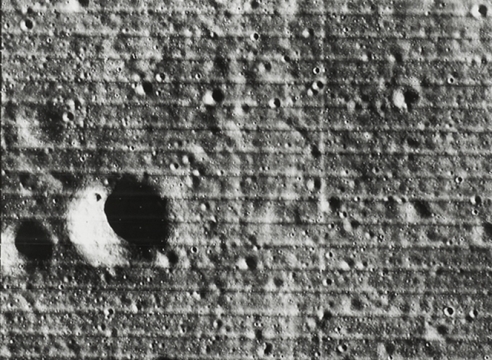 The Lunar orbiter and NASA team produced these images, but inherent in their nature is some sort of inexpressible mechanical arbitration. They raise plenty of questions about photography and the status of the photo-image as a form of mechanical reproduction. 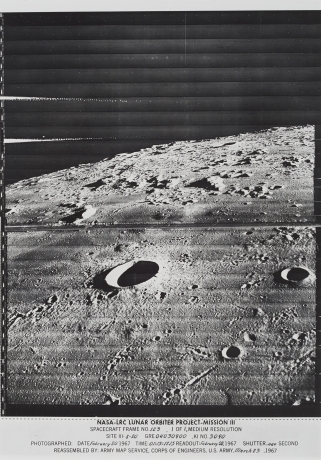 These stunning shots were produced through intricate yet effective series of steps, as follows: the lunar orbiters used an imaging system consisting of a dual-lens camera, a film-processing unit, a readout scanner, and a film apparatus, which would work together to capture the images, print them out in incredibly high resolution, scan them, and transmit them back to Earth where they were captured at three different facilities, to account for the Earth rotating as the data was beamed down. 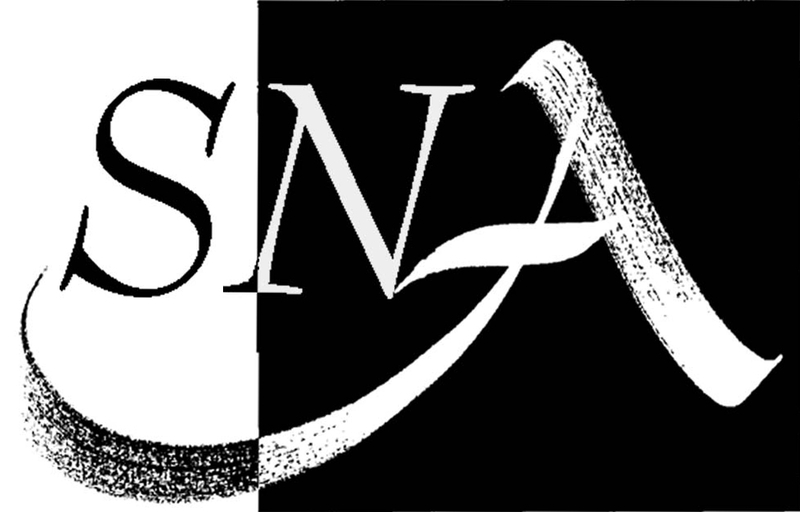 Using this data, NASA generated photo-negatives and then contact printed, using strip-negatives, some of the most picturesque and sublime silver-gelatin prints ever made, including the first-ever photograph of Earth from the perspective of the moon. Jason Jacques Gallery is located at 29 East 73rd Street, New York, NY.